We reviewed this restaurant early on in our blog and decided to revisit to ensure it was up to the same standard … in fact we visited several times just to be sure. One reason for returning was because Mama Lan has now opened more locations and we wanted to know if it was possible to maintain the high standards we found when it first opened. It is eponymously named after the chef’s mother and it serves Beijing street food. One difference is that the inside of Mama Lan has been remodelled to make the kitchen more accessible and still leave room for a few customers. Each table is for two and larger groups will have to shuffle the tables to make them more sociable. This time we visited on a Sunday and early – we wanted a more leisurely brunch, so sat down about 12.30 with a choice of places to sit. Situated at the main cross roads in Brixton Village it is great for people watching as the Village fills up at 1.00 pm. 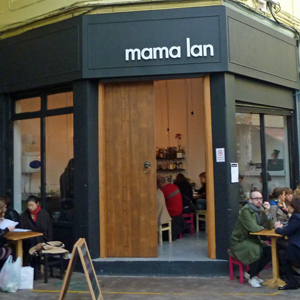 The menu at Mama Lan is not taxing – a couple of soups which seem to contain everything and lots of it, dumplings (5 to a plate) and, as side dishes, chicken wings, vegetable balls and seaweed salad. We headed into the dumplings (pork and Chinese leaf and the vegetarian version – Woodear mushroom, spinach and vermicelli noodle) and we also chose a portion of spicy chicken wings. We thought we would need other choices for three people but it turned out none of us had a large appetite that day. With a minimalistic decor and straightforward menu this place knows what it’s about and for a short Sunday lunch seemed ideal. We really liked the dumplings with the pickled carrot and cabbage accompaniment. Our favourite was the vegetarian ones as they had a more interesting texture. The pork, although tasty, was a bit dangerous as the sauce sprayed out as soon as you bit into it. 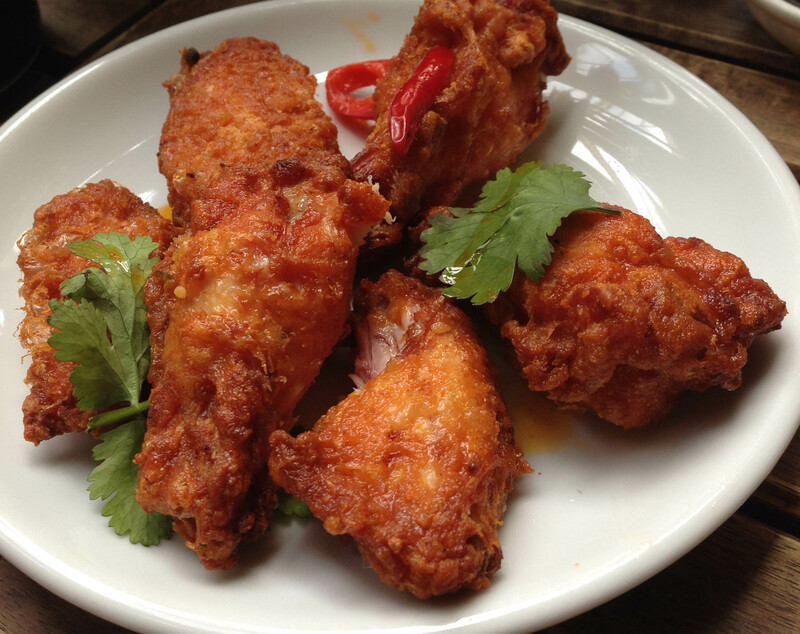 The chicken wings arrived first and were well cooked, spicy without being overpowering and juicy. 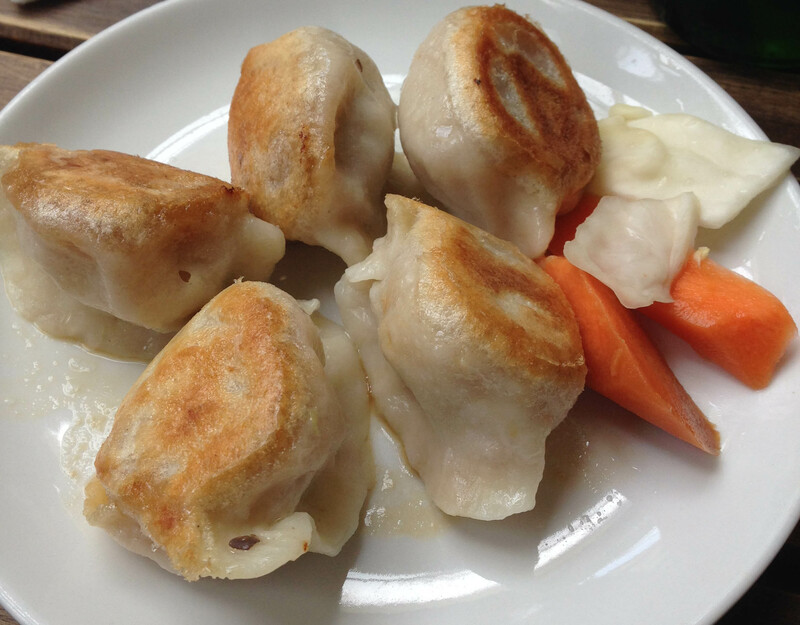 We mention this last word because as we ate we couldn’t prevent ourselves from comparing this restaurant with the one in Market Row – Happy Dumplings. The food was just not comparable – in Happy Dumpling the chicken wings were like sawdust and the dumplings were best forgotten. 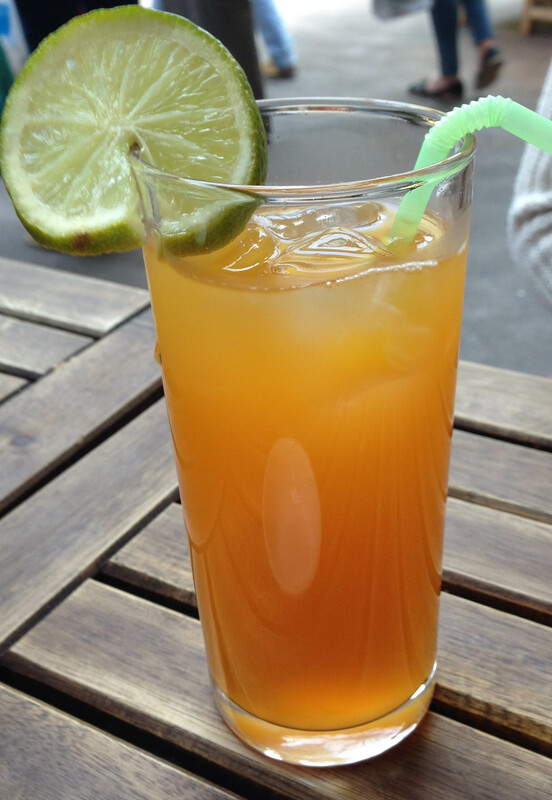 We washed everything down with a pot of Monkey Paw green tea, a bottle of Tsing Tao beer and a China Sour mocktail (apricot and lime juice). It cost a mere £16.50 for drinks and food and we left with satisfied – although we did pop along to Lab G for an ice cream to complete the meal. We will definitely be visiting both Lab G and Mama Lan again.